So lately, I've been a bit down in the dumps. When you feel like that you need (well I do anyway) to do something positive and creative, give yourself achieveable goals and try to have fun at the same time. I've always wanted to learn to crochet. I remember when I was a little girl, my grandma used to come and stay with us and in between reading the encyclopedia from beginning to end, she would crochet the most adorable little dressing table mats. I'm sure I must have tried to learn, but I never managed to master it. However, I saw a Learn To Crochet Workshop on the Purl City Yarns website a few weeks ago, so a couple of friends and I signed up. I was a bit daunted at first and wasn't really sure if I was going to pick it up at all, but I didn't do too badly at all. We were a bit disappointed that we didn't get much in the way of handouts...I think a booklet showing the basic stitches in picture form would have been useful as a reminder of what we'd learnt But I followed it up at home with an online tutorialm I googled and I was well away. 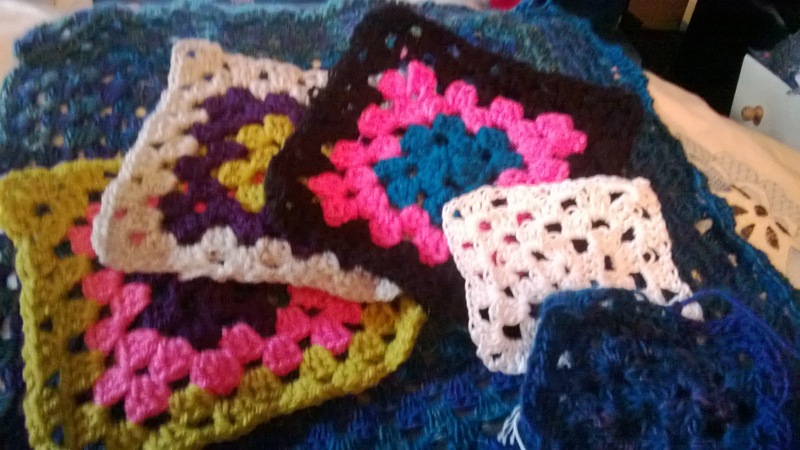 So much so, that my list of things I've crocheted in a week amounts to an abundance of flowers and granny squares in all colours, shapes and sizes and a cushioned size square which I'm going to sew onto one of those plain coloured cushion from Ikea. "my new adventures in crochet!!!!"